With nearly each suite sold out in the first phase of River City, Urban Capital Property Group has released a sister residence that will have a shorter stature, but will hardly be hidden in the shadow of its sibling. Situated at the mouth of the Don River, just south of King and River streets, the second phase of the condominium community will feature a connected trio of 12-storey white towers conceived by award-winning firms, Saucier & Perrotte Architects from Montreal and ZAS Architects from Toronto. “This is what we call the jewel of River City because it’s three little, white glass buildings surrounded by darker buildings, so there’s a prestige aspect to the development,” says David Wex, who his a partner at Urban Capital Property Group. 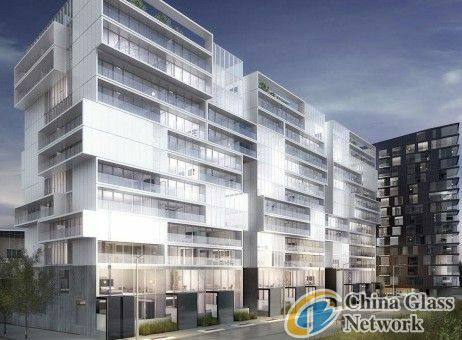 While the first phase will contain 350 suites in six- and 16-storey buildings on King and River streets, the second phase to the south will provide 249 suites in a more serene setting nestled beside two public parks. The one to the south, called Underpass Park, will transform the space under the Richmond-Adelaide ramps into a vibrant square with trees, seating, playgrounds and community gardens. The larger 18-acre green space to the east, known as Don River Park, will highlight native woodlands, rolling hills and open lawns. “Phase two opens right onto Don River Park, so it’s a real mix of nature and urbanism,” adds Mr. Wex. As for other metropolitan conveniences, River City will be the first residential project in the West Don Lands redevelopment, which aims to transform former industrial lands into a sustainable, mixed-use community with thousands of private residences, including a total of 900 loft-style suites and townhouses at River City, rental buildings, offices, schools and childcare centres. Waterfront Toronto, which was created by three levels of governments, will also ensure that new restaurants, cafes and shops are rooted in the neighbourhood, along with public spaces, parks and facilities for the Pan Am Games. Purchasers in the second phase of River City will also have exclusive access to a two-storey lounge and party room with a kitchen, bar and lounge areas, plus billiards and screening rooms, two fitness centres and a 15,000 courtyard – shared with phase one – with an undulating landscape, a floating deck, heated pool and dining area. The outdoors can also be enjoyed from the balconies of individual suites, which will range from studios to two-bedroom plans, including some with studies and dens. Two-storey townhouses on River Street will generally offer patios, mudrooms and direct access to parking. Saucier & Perrotte Architects will oversee the interior designs, which will feature nine-foot concrete ceilings, engineered hardwood floors, stone counters and back-painted glass backsplashes, as well as Energy Star stainless steel appliances. Just as the West Don Lands community will be incorporate the highest green building practices, River City will be a LEED Gold and carbon neutral building. Some eco-friendly components will range from heat recovery ventilators and water-efficient toilets and faucets to electric car charging stations, and car and bike sharing programs. Monthly fees will be 44 cents per square feet, plus individually metered utilities.